By Rev. Karoline M. Lewis, Ph.D.
Preaching the encounter between Jesus and the Samaritan woman at the well should first pay attention to the conversation itself. The following summation tracks the transitions in the dialogue and functions as an outline for these homily notes on the passage. Preaching on the Samaritan woman at the well should lift up her witness in contrast to Jesus’ dialogue with Nicodemus. Nicodemus and the Samaritan woman are unique characters to the Gospel of John. While modern Bibles have separated these two encounters with designated chapters and verses, there is little doubt that their proximity to each other invites comparison. Nicodemus is a Pharisaic Jew, a religious leader, a man, has a name, who approaches Jesus by night. The woman at the well is a Samaritan, a religious outsider, female, nameless, and meets Jesus at noon, the brightest part of the day. The conversation with Nicodemus lasts 9 verses whereas the conversation between the Samaritan woman and Jesus lasts 26. The opening verses of the chapter provide the setting for the encounter between Jesus and the woman. The first two verses are a reminder that conflict is ever present when it comes to Jesus’ ministry. Jesus has been in Jerusalem for Passover, the first of three trips to Jerusalem for this pilgrimage feast in the Gospel of John (2:13; 6:4; 13:1). The temple incident moved to chapter 2 in John’s Gospel brought to the forefront early on in the narrative the clash between Jesus and the dominant religious party. Now, Jesus will return to Galilee for a year before traveling again to Jerusalem for Passover in chapter 6. He leaves Judea to start back to Galilee and we are told that “he had to go through Samaria” (4:4). Even a casual glance at a map of ancient Palestine reveals that it is not, geographically speaking, necessary to go through Samaria when traveling from Judea to Galilee. In fact, a Jew would not journey through Samaria because of the risk of coming in contact with Samaritans. The rift between the Jews and the Samaritans is a complex history. Considered outsiders and even idolators by the Jews (2 Kgs 17) the Samaritans nevertheless understood themselves as descendants of the Northern Kingdom. The name means “keeper of the law” and the Samaritans held to the Pentateuch as their scripture. Their place of worship was Mt. Gerizim over against Jerusalem. The proper place to worship, or the primary religious center, is the issue that maintained the schism between the two groups throughout the centuries of the fissure, perhaps dating as far back as the 5th century B.C.E. People in the pew will be relatively aware of other stories of Samaritans (Luke 10:35-37) but will have little awareness of the scandal and surprise when it comes to a Samaritan embodying the truth of the Gospel. That Jesus “had to” go through Samaria is better translated, “it was necessary for him” to go through Samaria. The detail is not a geographical but a theological necessity. That Jesus must travel through Samaria is stipulated by perhaps the most famous verse in the Gospel of John, if not the whole Bible, John 3:16, “For God so loved the world.” The disciples, the hearers and readers of this Gospel, need to know what and who the world is. That God loves the world is not a euphemism but will be demonstrated by Jesus’ ministry in Samaria. The “world” is not a general claim about God’s love or a universal description of God’s positive inclination towards new believers. Rather, the world represents the entirety of God’s creation, including those who cannot imagine themselves as objects of God’s love. The “world” calls to mind the creation imagery present throughout this Gospel, first established in the opening verse, “in the beginning.” There is nothing or no one in God’s creation that or whom God does not love. The “world” also has a sense of “to the ends of the earth” signaling the abundance of God’s love first expressed in 1:16. God loves even those on the margins, the peripheries, the outer boundaries of the centralized community. This would have been a critical claim for the first hearers of this Gospel, struggling with their own reality of excommunication (9:22; 16:2). The fact that Jesus’ very next encounter in the Gospel is with the woman at the well confirms that God’s love is even for those on the outskirts of the religious center, good news for the audience for which this Gospel was written but should also elicit possibilities of what this might mean for those who feel unworthy of God’s affection and abundant love. Verse 5 establishes the underlying unity that actually exists between the Samaritans and the Jews. They both trace their lineage back to Abraham and his descendants. This is not just any well, but Jacob’s well, and Jacob’s well is a major betrothal scene in the Old Testament – Jacob and Rachel (Gen. 29), Moses and Zipporah (Exod. 2:18-22), Isaac and Rebekah (Gen. 24). The setting points to a number of possible interpretations of the encounter of Jesus and the woman at the well. First, there is an overt reference to marriage and relationships. This obvious allusion may feel uncomfortable to many Christians who attempt to remove Jesus from any real human emotion, feelings, or companionship. Surely, this specific setting could not possibly indicate any romantic or sexual thoughts on the part of Jesus, right? But, what if it did? What would be the purpose of evoking such images when it comes to a portrayal of Jesus? Answering this question mandates locating this story in the larger theological framework of the Fourth Gospel. To take the incarnation seriously demands that no aspect of what it means to be human is overlooked. At stake for the Fourth Evangelist is that Jesus is truly God in the flesh and every aspect of what humanity entails God now knows. This setting also calls to mind the levels of intimacy that abound in this Gospel. As Jacob’s well is a site of betrothal and relationship, the wedding at Cana also comes to mind. That miracle of abundance is that which should be anticipated in the encounter that follows. The categories of intimacy are given full representation in the Fourth Gospel, including father and child, mother and child, marital, and friendship. By desiring an intimate relationship with us, God also wants to experience the full spectrum of intimacy. God is presented as Father with children, as friend, and as lover. The verses that establish the setting for the encounter in chapter 4 end with an important detail, “it was about noon” or “the sixth hour.” Nicodemus came to Jesus by night. Now, the woman at the well meets Jesus at the lightest and brightest part of the day. Many commentators interpret this odd time to draw water as a statement about the woman’s morality. She comes to the water at noon because she does not want to be seen by others, she’s embarrassed by her questionable past, or that she has been ostracized to come to the well when no one else is around. Each one of these interpretive directions favors modern inclinations about marriage and sexuality over the major themes of the Gospel. Jesus is not interested in her moral framework. Such curiosity makes little sense for this Gospel where issues concerning morals, values, and what we would equate with sin, are of little significance. For John, sin has nothing to do with past actions or present indiscretions. Sin is a synonym for lacking a relationship with God. To cast judgment on the perceived “sin” of the woman misconstrues what sin is for the Fourth Evangelist. The reference to the time of day points to the theological theme of light and darkness, with darkness representing the realm of unbelief and light, the realm of belief. The fact that the Samaritan woman meets Jesus at noon invites hopeful anticipation of this conversation compared to her counterpoint in Nicodemus. Jesus is tired, yet another reminder of his finitude. The trip between Jerusalem and Galilee would have taken about three days. Jesus is worn out. He needs water, as does she. He is vulnerable, in need, and she can be the source of his need. There is a mutuality of need present before the two ever utter words to each other. The first words exchanged between the woman and Jesus are spoken by Jesus as a request to fill his need. Jesus needs water and she has what he needs. Jesus needs water and she will need his living water. Jesus needs her to be a witness and she needs Jesus to invite her into this new identity. Jesus’ first words also draw attention to Jesus’ humanity. He is dependent on her, modeling the mutual dependence on which relationship and discipleship is based. This interdependence is accentuated by his request. He asks for what he will provide for her. The importance of the reciprocity in relationship is critical for understanding the Fourth Gospel’s construct of discipleship. True relationship, true intimacy necessitates mutuality, equality, and regard. The parenthetical (in English translations) remark that “the disciples had gone to the city to buy food” is by no means tangential. That the disciples are absent, presumably in Sychar to gain provisions for their ongoing journey, means that Jesus and the Samaritan woman are alone at the well. The boundaries crossed in this encounter continue to build. We have a man speaking to a woman, a rabbi speaking to a woman, a Jew speaking with a Samaritan, a Jewish rabbi speaking with a Samaritan, and now, we find out, they are alone. Verses 7 and 9 repeat her identity as a “Samaritan woman,” not just a Samaritan and not just a woman, so as to underline the unfathomability of the conversation that will follow. The comment in parentheses that follows is perhaps the biggest understatement in the entire Bible. Jews indeed do not share things in common with Samaritans, nor do they come in contact with them for any reason whatsoever. To do so would necessitate a return to Jerusalem for Jesus, a ritual cleansing for contamination. Jesus’ answer (4:10) is similar to the cryptic response given to Nicodemus in his conversation with Jesus (3:4) Both Nicodemus and the Samaritan woman’s first words reflect their sense of place and identity, an awareness of who they are and an indication that an encounter with Jesus will cause a change. Jesus’ answer stands in the grammatical construction of a contrary to fact condition. Jesus gives specificity to the water that he offers, living water, thereby making an attempt to help the Samaritan woman see something beyond the observable in Jesus. Her answer parallels that of Nicodemus in 3:4. She states the obvious, that Jesus does not have a bucket. It is hard to know how she hears the adjective of “living” water. Literally, the verb zoē connects to life, having to do with life. She may interpret this is simply basic water needed for sustaining life. There is a tone of “who do you think you are?” in the woman’s next question for Jesus. Her reference to Jacob as “our ancestor” once again emphasizes the same ancestry for both Jews and Samaritans and in this case also demonstrates that she understands fully where they are sitting and talking, at Jacob’s well. Her description of the well, “and with his sons and his flocks drank from it” (4:12) stresses the theme of provision underlying this entire scene and helps make sense of her misunderstanding. She knows that this well has provided for God’s people for centuries. And now, in Jesus, she is being invited to see that God is still providing for God’s people in Jesus. In verses 13-14 Jesus demarcates between the water in the well and the water that he provides by introducing the concept of thirst. Jesus attempts to move the woman beyond the literal concept of water to a different idea of what it means to be thirsty and for what we thirst. At the same time, it is couched in the very bodily, incarnational reality of what water gives. When God becomes human, there is grace upon grace (1:16) which is as simple and as profound as our essential needs. Moreover, the water that Jesus provides, unlike a well, will never dry up. The last participle, “gushing up to eternal life,” is a present participle, emphasizing the never-ending, ongoing presence and reality of God as the source of life, now and eternally. Verse 15 indicates that the Samaritan woman is still making sense of Jesus’ words from a literal perspective, but there are three significant aspects of her response that disclose how far the conversation has come. First, she reiterates Jesus’ description of the water he provides, “this” water. She is able to distinguish a difference between the water that Jesus offers her and the water she has come to draw each and every day. Second, something has changed if she states that she will never be thirsty. Of course, she will. She has shifted her understanding of thirst to something else, yet not quite certain of what that “something else” might be. She has moved, however, in her understanding of who Jesus might be, from a thirsty Jew with no manners, to someone who has what she needs at a very basic level. The final section of her answer divulges the totality of her situation. As a woman, she would have been required to visit the well twice a day, early morning and early evening. Preaching might give her a chance to voice what it would mean to be relieved of that ritual. The next section of the dialogue seems abrupt. Why would Jesus ask the woman to call her husband at this point? How does her marital status or the presence of her husband have anything to do with the conversation thus far? Reading forward to the Samaritan woman’s response to Jesus’ request is helpful for interpreting the meaning of this section. She will see Jesus as prophet. What he knows about her is not simply general information about her life, but the most painful reality in which she has lived and now tries to survive. The nature of prophecy for the writers of the New Testament had no other understanding of prophecy outside of their scriptures. Unlike our present perceptions of prophecy, which assume prophecy as prediction, prophecy for the Israelites and therefore, the Jewish Scriptures, is history. The prophets are historical books because they narrate events in Israel’s history through the role of a particular prophet in that moment in history. The woman sees that Jesus is a prophet, not because he has predicted something yet to happen in her life, but because he has named the truth about her life, a truth that is heartbreaking and most likely the reason she finds herself alone at the well at the wrong time of the day. It also situates the reason for the subject of this exchange. The conversation between Jesus and the Samaritan woman at the well has the potential to progress beyond that between Jesus and Nicodemus. Jesus instigates this progression in her recognition by going to the heart of the matter and why he had to go through Samaria in the first place. For her to be able to see who Jesus is means that Jesus has to reveal not only who he is, but who she is. In this interchange, her need for him must be named so as to make sense of the mutual dependence between believers and Jesus. Jesus’ reason for asking about her husbands is not to condemn her for her past. She is not a “five time loser” or a tramp as many sermons still claim. There is no proclamation of forgiveness for her questionable morals. There is no exclamation of judgment for her assumed sin of sexual impropriety. Yet she is continually blamed for her plight and charged with behavior for which there is no textual or historical proof. Sermons on this story will have to continue to free her from a hermeneutic that perpetuates the sexism that is alive and well in the church today. To have been married five times in ancient Palestine would be attributed to circumstances completely beyond the control of any woman at that time. Likely widowed or divorced, the fact alone of five husbands would have indicated some sort of curse against her or her family. It was necessary for a woman’s survival to be married, thus the numerous injunctions in Scripture for the care of widows. To have had five husbands could also mean that she had been divorced, for most trivial matters, as was acceptable, but most likely because she was barren. If she was barren, that would mean that she would not have family to turn to in the case of being widowed and further exacerbates her dependant status. The fact that she is currently living with a man not her husband does not mean a modern day “shacking up” or “living in sin.” Rather, her situation was probably a levirate marriage. By law (Deut 25:5-10), the brother of the dead husband was obligated to take in his dead brother’s wife, either by formal marriage or living arrangements of some kind. Preaching on the woman’s situation that is historically informed is a necessary correction to sermons that continue to marginalize Jesus’ first true witness. At the same time, recognizing the fullest extent of the situation of the woman at the well is a theological necessity for the Fourth Gospel. Jesus’ revelation to her is not just that he knows about her, but that he knows what it means to be her. God is revealing God’s self in the Fourth Gospel as the Word made flesh. At stake in this encounter is the incarnation itself. For Jesus to name anything else about her other than that which is has completely defined her reality up to this point would be to not take the incarnation seriously. When the woman sees that Jesus is a prophet (4:19), she asks Jesus the most important theological dispute that remained at the heart of the discord between the Jews and the Samaritans – where to worship God. That she asks this question of Jesus should not be overlooked. First, she asks a theological question. Regardless of historicity or probability, the Fourth Evangelist puts on the lips of this Samaritan woman the theological question not only at the core of the rift between the Jews and Samaritans but of the Gospel itself. Upon the return to Palestine after the exile, the Samaritans built their temple to worship God on Mount Gerazim. The Jews began their rebuilding of the temple on the temple mount in Jerusalem. Reference to these building projects is not about convenience or religious disagreement. They have everything to do with the belief in and commitment to God’s presence. Central to John, and essential for all of the Gospels as post 70 C.E. writings, is the location of God. In John, moving the temple incident to the second chapter (2:13-21) made clear that the presence of God is no longer in the temple, but here, now, right in front of you. The fact that it is a woman from Samaria that first asks of the presence of God is profound. It is another means by which to emphasize 3:16, “For God so loved the world.” God will first reveal God’s self to her. 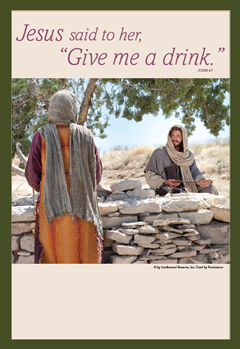 Jesus’ response to the Samaritan woman confirms the essence of her inquiry. “Neither on this mountain nor Jerusalem” could be a title for the Gospel of John. Jesus’ answer foreshadows the response of the man born blind, who, when Jesus finds him after being expelled by the Jewish leaders, says, “‘Lord, I believe.’ And he worshiped him” (9:38). To recognize who Jesus is to worship who he is (4:22-24). The woman’s response to Jesus’ injunctions about worship names another partial truth about Jesus. He could be the Messiah. She has moved to another level of understanding of who Jesus is. At the same time, Jesus is the Messiah, but there is more to the story. Jesus’ reply to the woman’s belief in the Messiah is the first “I AM” statement in the Gospel of John. There are two different categories of “I AM” statements in the Gospel of John: the “I AM” statements with a predicate nominative (6:35; 6:51; 8:12; 9:5; 10:7, 9, 11, 14; 11:25-26;14:6; 15:1, 5) and the absolute “I AM” statements (4:26; 6:20; 8:24, 28, 58; 13:19; 18:5, 7). The “I AM” statement in 4:26 is the first absolute “I AM” in the narrative. Most translations “I AM he” are misleading by including the pronoun “he” after the “I AM.” The “he” does not exist in the Greek text and takes away the power of the “I AM” on its own. The absolute “I AM” statements are meant to be a direct claim of who Jesus really is, the revelation of God, as God did to Moses (Exod. 3:14), but now in a new and unique way. The response of the woman to Jesus’ revelation is interrupted by the return of the disciples who had been off in the city to purchase food. They are surprised when they find Jesus speaking with a woman, a Samaritan woman! Yet, whether fear, misunderstanding, or astonishment, none utters a word about Jesus’ encounter. This interlude between the first “I AM” statement and the woman’s departure has three functions. First, it gets the disciples back to the well which anticipates Jesus’ explanation of what he has been up to since the disciples have been gone. Second, it emphasizes further the shocking nature of this encounter, lest we forget after the lengthy conversation up to this point. Third, the questions themselves reiterate key themes in this passage and in the Gospel. “What do you want?” Is better translated, “What do you seek?” The answer, of course, is her. He came to the well, he had to go through Samaria, to find her. Jesus’ first words to his disciples in 1:38 use the same verb, zēteo, “what do you seek,” “what are you looking for?” The tables are turned, so to speak. Jesus asked them, “what are you looking for?” They now ask the same question of him. He is looking for believers, disciples. The detail provided in verse 28, “then, the woman left her water jar” is a sermon on its own. What does this seemingly unimportant element have to do with her return to the city and her conversation with Jesus? Is she in a hurry, excited about sharing what happened at the well? Did she simply forget and now she will have to return later in the day to pick it up? If we press a theological question, what did she leave behind at the well? This verb can also be translated “let go.” She leaves behind her ostracism, her marginalization, her loneliness because Jesus has brought her into his fold. She leaves behind her disgrace, her disregard, and the disrespect she has endured to enter into a new reality, a new life that is abundant life. The juxtapositions of what she leaves behind and what she gains are striking. As noted in our discussion above, she is probably barren. Her barrenness is answered by her birth of new believers. Her rejection is replaced by a renewal of hope, in Jesus as the promised Messiah, in her own sense of purpose. Her lack of any individuality is interchanged with a new identity of being a witness. What happens to the woman at the well is a microcosm of the larger juxtapositions that permeate the Gospel as a whole: human and divine, flesh and spirit, light and darkness. The woman’s transformation is no mere new vocation or passing conversation with Jesus. Her encounter with the Word made flesh brings her into the theological reality that undergirds the entire Gospel. She is not only example of what it means to be a witness. She embodies fully the transition from darkness to light, from outsider to insider. She is, for all intents and purposes, reborn. Verses 28-29 narrate the woman’s return to her city. The first words in her invitation to her people are the same words Jesus utters in the calling of the first disciples (1:38). Jesus first says to the disciples, “what are you looking for?” The disciples’ response, “where are you staying?” is better translated, “where are you abiding?” To know where Jesus is abiding, which is right here and right now as the Word made flesh, as this unique revelation of God, is essentially all that is needed for a relationship with Jesus and is the primary category that describes what a relationship with Jesus looks like. The Greek term menō is absolutely central for the Gospel of John. Jesus answers the disciples, “come, and see.” They do and abide with Jesus. The woman at the well invites her townspeople to the very same possibility. Remarkably, the invitation comes without certainty. The question in Greek, “he cannot be the Messiah, can he?” (4:29) expects a negative answer. A more accurate translation might be, “Surely, this cannot be the Christ, can it?” There is extraordinary promise in this moment of uncertainty. It suggests that in order to be a disciple or witness of Jesus does not demand full and complete knowledge or conviction. It intimates the primary mystery, extraordinariness of the Word made flesh. For the woman at the well to be definite about her encounter with and discovery of Jesus would take for granted what God has done, as if God becoming human was a most ordinary, understandable, and expected choice on God’s part. In response to the woman’s words the people leave the city and go to meet Jesus. In the meantime, there is an interruption. The encounter with Jesus is postponed and anticipated. The interlude in verses 31-38 at first glance seems like a bizarre transition. The disciples are convinced that Jesus must be hungry and urge him to eat. Jesus responds with cryptic words similar to those addressed to Nicodemus and to the Samaritan woman, which then lead to misunderstanding and again, literal interpretation. The use of misunderstanding in the Gospel of John is not just a rhetorical, grammatical, or syntactical tool but is meant to emphasize how really astonishing this all is. It underscores the incredulity of what is being presented theologically, that God decided to become human. The farming image used by Jesus in 4:34-38 has a dual function. It provides the disciples with a vivid picture of what discipleship looks like for this Gospel. That the field is ripe for harvesting intimates abundance, a major theme of the Gospel. “Four months more” points to urgency. The disciples need to see that the possibility to transform people into being witnesses to or disciples of Jesus is here and now, not a later harvest because of the temporariness of the incarnation. The language of sower and reaper reiterates for the disciples that their witness, their discipleship is indistinguishable from Jesus’ own. The understanding of discipleship presented in the Fourth Gospel has the disciples doing the very works of Jesus, “you will do greater works than these” (14:12). Once Jesus ascends to the Father, it will be the disciples who will be the presence of the “I AM” in the world when Jesus is not (cf. 21:15-19). There is a radical sense of how critical the incarnation is even beyond the incarnated Word. The incarnation is not just a claim about God, but a claim about the importance of humanity. This emphasis on incarnation means that at stake for discipleship, for being a believer, for being a witness, is the full and embodied expression of what it means to be human. The woman at the well, who she is and what she represents, is representative of this claim. She reveals that God takes the entire spectrum of humanity seriously. What it means to be human will not be limited to certain groups or constituencies. The fullness of the Word made flesh, its abundance, and the theological claims of the incarnation would fall flat if the totality of the expressions of humanity were not represented. Remarkable about John 4:1-42 is the witness of the woman at the well but also the witness of the people of her town as a result of her invitation and their own encounter with Jesus. Verse 39 reports that many of the woman’s townspeople believed in Jesus because of her witness to them. The Samaritans respond to the woman’s testimony and invitation to “come and see” by going to Jesus and inviting him to stay with them. Most translations will say “stay” or “remain” but the verb is menō. As noted above, menō functions as a synonym for relationship with Jesus. To abide with Jesus is to be in an intimate relationship with him. The Samaritans are not asking Jesus to hang out for a few hours. They are speaking the primary language of relationship according to this Gospel. In addition, as a result of this abiding, more Samaritans believe. Once again, there is an overlap of terminology that serves to underscore the intimacy of relationship into which this Gospel invites the reader. Abiding and believing are synonymous and the first persons beyond the first disciples to experience this relationship with Jesus are Samaritans. We are once again taken back to 3:16, “For God so loved the world.” This entire story of Jesus in Samaria is an embodied presentation of what this verse means. Jesus, the Samaritan woman at the well, and her villagers, have acted out what God loving the world looks like. The comment of the Samaritans to the woman (4:42) in no way discounts her witness. Rather, it points to a primary theological commitment of the Fourth Gospel, that to believe in Jesus must come down to an individual encounter and “krisis” according to 3:17. To believe in Jesus is not assent to commitments or claims about him but to be in relationship with him. This Gospel insists that in order to come to believe in Jesus as the Messiah, the Son of God, and to have life (20:31), you must have your own encounter with Jesus. Once again, the essentialness of the incarnation is underscored. The incarnation must be experienced and not simply affirmed or confessed. That God became human demands that God be fully experienced, encountered, and embodied. The final confession of the Samaritans about who they perceive Jesus to be is nothing short of remarkable. The only time Jesus is called “savior” in the entire Gospel of John is here and by outsiders. Nicodemus was not capable of seeing this possibility of Jesus’ identity and not even the disciples will name Jesus as “savior.” While a well-known and oft-used descriptor for Jesus, the term “savior” appears infrequently in the Gospels (Luke 1:47, 69; 2:11). What does it mean for the Samaritans to recognize Jesus as savior of the world? This combination, “savior of the world,” encapsulates the breadth and depth of God’s purpose in becoming incarnate in Jesus. The Samaritans are the world, representing what the world can and should look like when it comes to the ministry of Jesus. The emphasis on the world in the Fourth Gospel intimates God’s intention to be for the entirety of God’s creation. The outward focus of this Gospel cannot be separated from its creational claims. This Gospel is deeply rooted in the creation story and thus, God’s coming into the world as Jesus must be for all of God’s creation. At the same time, this unique declaration of Jesus’ identity, particularly coming from the Samaritans demands the question, “what does it mean to be saved?” especially for the Samaritans? The usual definitions of salvation, particularly if they come from vague and dislocated dogmatic, doctrinal, or post-biblical arguments, will not suffice for this Gospel and especially for the Samaritans. For a Gospel that has as its central theological statement that God became flesh, salvation cannot be an abstract assertion or a declaration uprooted from reality. To do so would be to say that the incarnation is simply a generic construct and would undermine completely the theology of John. To preach Jesus as savior in the Gospel of John must take absolutely seriously the particularity of salvation according to John that is then located in the larger claim of abundant and eternal life. Salvation for this Gospel is here and now, for the Samaritans, for the woman at the well, for anyone who has an encounter with Jesus. While there is a certain promise of life beyond death that is imagined as being at the bosom of the Father in the ascension (1:18; 13:23), to know abundant life means that abundance is not capable of being delayed. As a result, salvation is present, an eschatological promise that is in the moment as well as in the future. Preaching the meaning of salvation from the particular witness of this moment in John will invite a different and perhaps more robust soteriology than what preaching tends to proclaim. Rev. Dr. Karoline M. Lewis is currently Associate Professor of Biblical Preaching and The Alvin N. Rogness Chair of Homiletics at the Luther Seminary in Minneapolis, Minnesota. She has also held adjunct faculty positions at Augsburg College in Minneapolis, Candler School of Theology in Atlanta and Columbia Theological Seminary in Decatur, Ga. Ordained in the Evangelical Lutheran Church of America, Lewis was associate pastor of worship and education at Amazing Grace Lutheran Church in Lawrenceville, Ga. She is a member of the American Academy of Religion, Academy of Homiletics and the Society of Biblical Literature. A graduate of Northwestern University in Evanston, Ill., Lewis received a Master of Divinity from Luther Seminary and a Doctor of Philosophy in New Testament studies from Emory University in Atlanta. Lewis is the author of “Rereading the ’Shepherd Discourse:’” Restoring the Integrity of John 9:39-10:21, the introduction and study notes for the Gospel of John in the Lutheran Study Bible and co-author of “New Proclamation: Year B, 2009, Easter through Christ the King”. In addition to her teaching duties, she is a contributing writer to WorkingPreacher.org and co-host of the site's weekly podcast, Sermon Brainwave.